Citing specific examples including both the name of the director and the title in question, filmmaker Jim Jarmusch once stated that “quirky” was the most overused descriptive label applied to independent movies by critics and journalists alike. And given the diversity of some of the works referenced and the implication that by sheer definition alone, “quirky” made certain movies seem either interchangeable or sillier than they actually were, at the time he had a valid point. Yet when you mentally fast forward roughly a decade, it's hard to deny the fact viewers of independent cinema have been inundated with some ridiculously odd material to the point wherein you can actually divide the varying degrees of quirkiness into sub-genres like Quirky Romantic Comedy or Quirky Dysfunction . Whether or not this has came to fruition as some sort of a self-fulfilling prophecy since the media hammered the message home so hard that the word “quirky” had become gospel is impossible to judge. However and regardless of whether or not the filmmakers believe they're being emotionally authentic, even the most casual glance at the published plot summaries contained within any indie film festival guide are apt to make you wonder if stories rooted in reality just don't cut it anymore… even for those working on a shoestring budget that they themselves supplied. If Sofia Coppola's Lost in Translation were remade by Michel Gondry and Noah Baumbach, the result may look something like the feature filmmaking debut of married writer/directors Kieran and Michele Mulroney. Injecting the screenplay for Paper Man with a bizarre blend of unsettling humor and awkward tragedy seasoned with an overflowing cupful of quirky dysfunction, the Mulroney’s Paper Man is a ho-hum work of hokum centering on Jeff Daniels’ writer’s block plagued novelist Richard Dunn who’s as stuck in his life as he is in his work. Richard is married to a brilliant surgeon (Lisa Kudrow) who is at once both supportive and exasperated by a husband who still hasn’t outgrown his superhero styled imaginary friend, Captain Excellent (Ryan Reynolds). Nonetheless, she rents a place in Montauk, Long Island with the hope that the change of scenery will inspire him to crank out his next manuscript. Yet in stark contrast to his wife’s work week spent saving lives in the city, Richard wanders around Montauk where he’s surprised to encounter a fellow insecure misfit in the form of wise-beyond-her-years but likewise existentially stuck seventeen-year-old Abby (Emma Stone). What begins as a dubious business arrangement wherein the childless Richard hires Abby to be his babysitter and leaves her to watch the place while he waits outside in the freezing cold for two hours, soon evolves into an unexpected friendship as the seemingly opposite twosome discovers they have a lot more in common than they'd imagined. Initially bonding together over simple pleasures like homemade soup to building a couch out of endless copies of Richard’s first failed novel (*coughs* quirky), eventually Abby begins to open up about the devastating local tragedy that robbed her of her innocence and turned her into Montauk’s outsider freak at the same time. 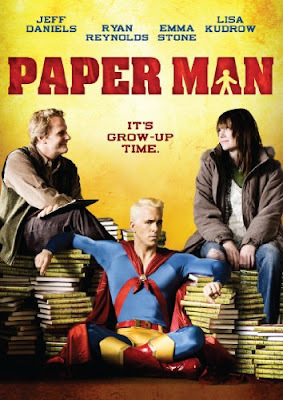 Although its heart is in the right place, Paper Man requires more than the usual amount of suspension of disbelief considering not just the existence of Captain Excellent but the unquestionably creepy set-up of a middle aged man asking an under-aged girl to be his babysitter. Moving uneasily from sweet to sour, overall everything about Paper Man feels transparently manipulative and particularly so in the cruel payoff that occurs in Abby’s life during the last scene she shares with actor Kieran Culkin that’s ironically meant to further link our two leads together as platonic soul mates. Anchored by remarkably earnest performances, particularly with regard to scene-stealing Golden Globe nominee Emma Stone (Easy A ), overall Mulroney's Man is a gimmicky case of quirky dysfunction disguised as plot. And similar to the way you can overpower homemade soup with too many ingredients, Paper Man gets bogged down by contrived plot resolutions and character arcs that spin in a certain way that's guided less by logic than the all-consuming indie film passion for quirk.